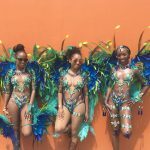 Island Girls In-Transit is a blog series that features amazing Caribbean women who are pursuing their wanderlust with that signature West Indian passion and pride. 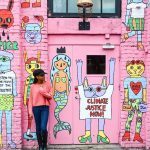 We’re an underrepresented segment within the travel community but it is my hope that these stories will serve as a source of inspiration for women throughout the region who dream of traveling the world! 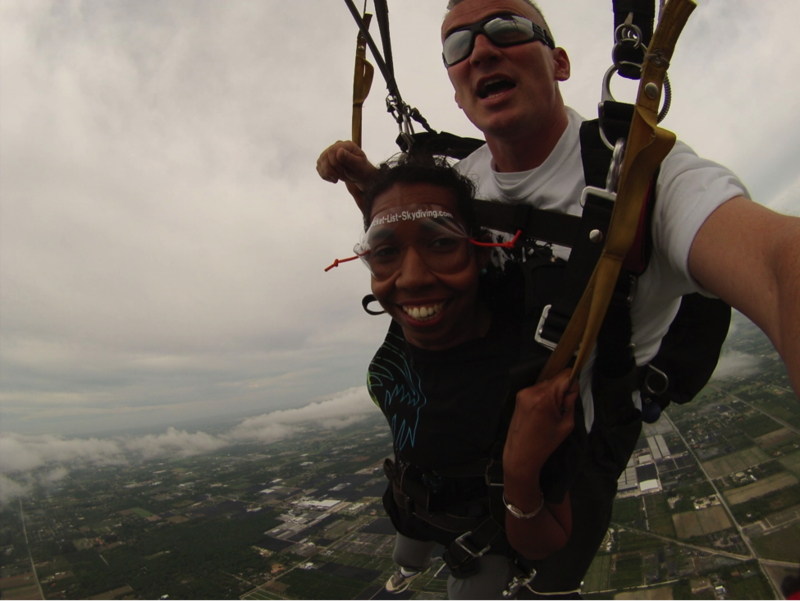 Ria Gopaul skydiving in Miami in June 2015 – she got an adrenaline rush to last me a lifetime, but she’ll gladly do it again! 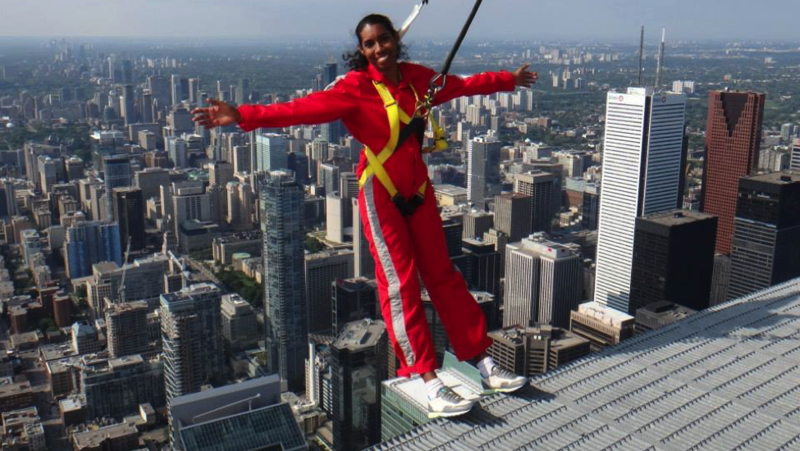 This year’s Island Girl In-Transit series wraps up with Ria Gopaul – a wanderlust wizard from Trinidad and Tobago who has visited 38 countries across the Caribbean, the Americas, Europe and Asia! A resourceful traveler with an adventurous streak, Ria’s international jaunts have taken her to many intriguing places. I love following her on Instagram, namely because she seems to always be on the go and you just never know where she’ll end up next! Whether she’s in-transit for work or play, Ria always makes the most of every destination. Read on to learn some wonderful insights from this seasoned island girl traveler. 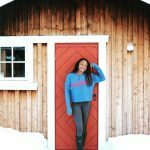 Linked to being a light packer, I’m a budget traveler, but I’m a cut above backpacking and hostels – I require a little more comfort and privacy. I am a planner yet I go with the flow. I do lots of pre-travel research to capitalize on early bird discounted rates and to help manage my time and costs, but with that said, my plans are often flexible. I always leave room in my itinerary for impromptu activities and changes in plans…like missing a train. Resilience in travel is key. I am an ‘on the go’ traveller – I am there to see and do, so I barely spend time in my accommodations; rather, I’m usually up and about at daybreak, maximizing every minute of the day exploring and experiencing all that my destination has to offer, returning to my room only for a shower and a good night’s rest. I usually am an off-peak traveler – I prefer to travel outside of busy seasons so that I get roam freely without the hassle of crowds, and to get a more intimate and relaxed experience. My travel time is precious and therefore not to spent standing in long queues. I’m comfortable as a solo traveler, but I prefer having one other person with me to share the fun and memories, and provide an extra sense of security, but they must have a similar joie de vivre and adventurous spirit as me. Travel is fun, exciting, and eye-opening. It’s entertainment for my lively soul, the cure for my itchy feet and the best form of education for my curious mind. Plus, I get to meet and make memories with so many wonderful (and some ‘odd’) people around the world. 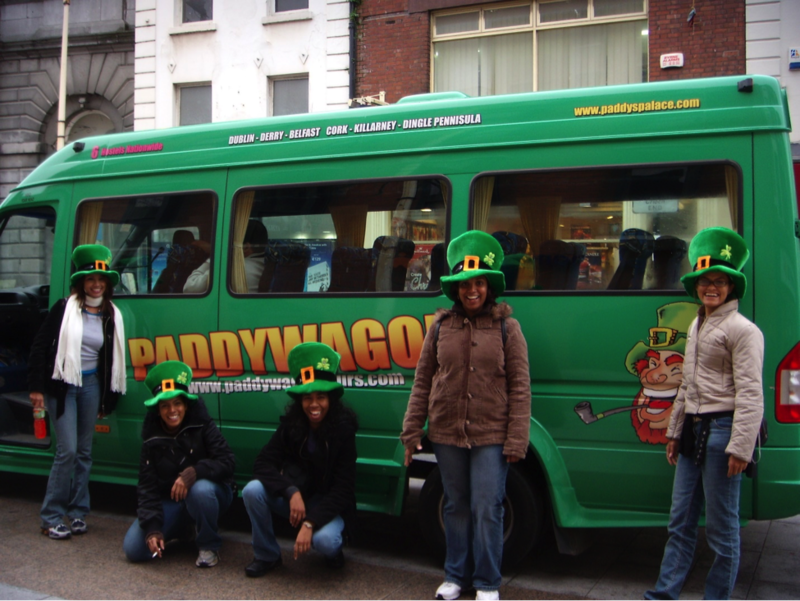 Ria Gopaul and her friends all set for their bus tour in Ireland. My passport (with my travel visas) and my credit card. Everything else I can manage without or pick up on my journey. Around the age of 25, I caught myself mentally calculating the price of things in terms of how much they cost in ‘trips’, and walking out of clothing and shoe stores empty-handed. 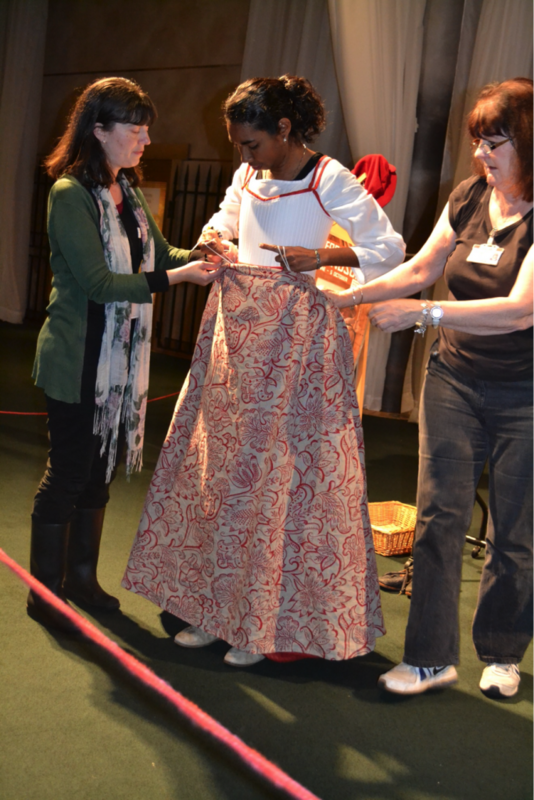 If for the price of a new outfit I could spend a weekend in Tobago, you’d find me in Tobago sporting my ‘old clothes’. Definitely my Mom! She’s been my main companion during my world travels over the years and we’ve had, and continue to have, an absolute blast making mother-daughter memories around the world. I even take her along on my work travels when possible. She manages to keep pace with me and sometimes she’s even more adventurous than me! This apple didn’t fall far from the tree. 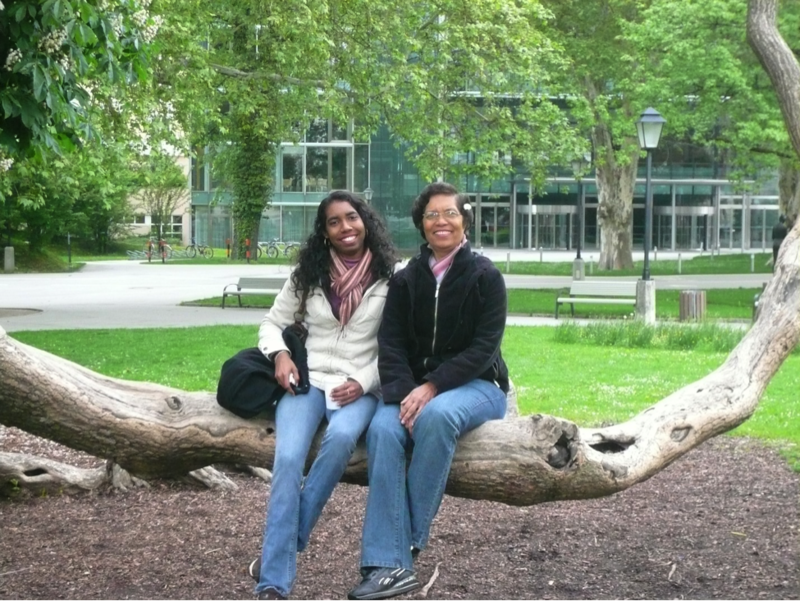 Ria Gopaul and her mom in Mirabellgarten, Salzburg Austria in May 2010 where scenes from the Sound of Music where filmed (Maria taught the children to sing “Do-Re-Me” here). Hmmm, so many great ones, but the one that comes first to mind is my visit to the town of Trinidad, Cuba earlier this year (Feb 2018) with my Mom and sister. After exploring the Iznaga Tower, we purchased some coconuts from a nearby local vendor who surprisingly ‘topped up’ the water in each of our nuts with a huge pouring of rum! He told us ‘Es normal en Cuba’! On a high for more ‘local experiences’, we enquired from the vendor where we could have an authentic Cuban coffee experience nearby. Before we could blink twice, we were ushered into a humble house across the street and invited into a family’s kitchen where the grandmother of the house demonstrated the entire coffee-making process, showing us her personal stash of a variety of beans in the many phases of preparation. Our impromptu coffee demonstration ended 10 minutes later with us sipping on some strong Cuban black coffee while seated among the entire family in their living room having a jovial conversation despite a language barrier – sign language and their limited English mixed with our poor Spanish more than sufficed. A local Cuban coffee experience doesn’t get more authentic than this! From their warm smiles and generous hearts, you would never have guessed this was a very low-income family living a simple life. And yet, they refused our money when we offered to pay for the ‘tour’, for the cups of coffee or for the jar of their personal stash of grounded coffee they insisted we take as ‘coffee to go’. We left feeling like family, and they acted as if we were leaving home. I guess as Trinis in Trinidad, we were ‘home’! 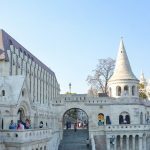 It’s tough to choose a favourite; I have never been to a destination I didn’t love, and I try not to compare but to appreciate each location for its unique charm. However, if you were to offer me a free trip to revisit any of my previous destinations, I’d choose Switzerland. Such unspoiled beauty with placid lakes, charming towns, quaint villages, cosmopolitan cities and towering castles, not to mention the shopping, wine tasting, delectable chocolates and cheeses…makes it a beautiful country worth revisiting a million times, especially in autumn. 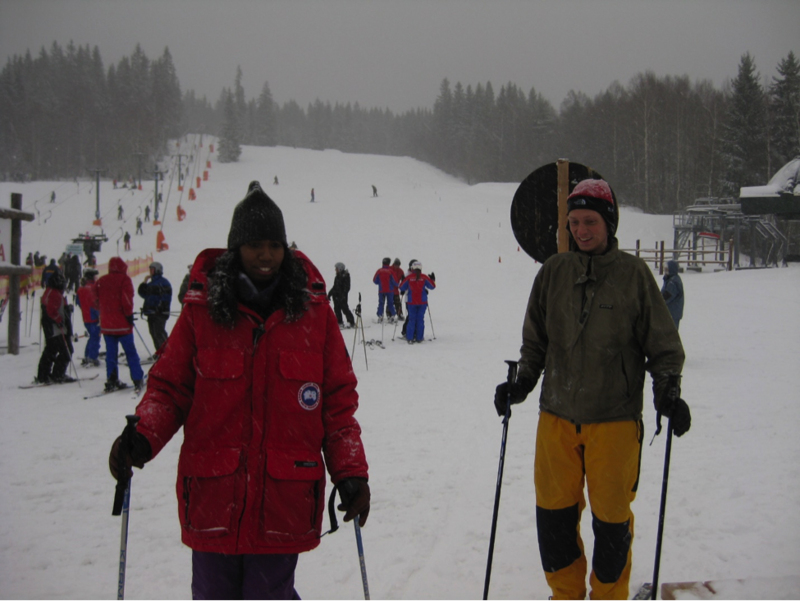 Ria Gopaul learning to ski at Romme Alpin in Borlange, Sweden – Jan 2009. I’m a light traveler (to facilitate easy commutes and low cost flying), but traveling to ‘cold countries’ with just a carry-on and hand luggage is always a challenge. Once, on a winter trip from England through Europe, I refused to upgrade to a large suitcase or extra luggage and came up with a ‘brilliant plan’ to pack my clothes, sweaters, boots, scarves and gloves in my carry-on luggage and to wear all 3 of my heavy coats simultaneously as I made my way through the airport. I just needed to make it onto the plane and then I could stuff everything in the overhead lockers. Needless to say, I looked extremely ridiculous, could barely move my arms, was sweating beneath all my layers and had loads of clothes to remove to go through airport security. So this plan was a one-time-only solution. Since then, I have implemented Plan B: I have left several articles of winter clothes scattered across the globe (in the US and in UK), up in the attics or down in the basements of family and friends’ homes. I therefore only travel with one coat, one pair of gloves, scarf and boots and I pick up my winter gear at the most convenient ‘stash’ on route to my winter destination. A much more practical solution! Ever since I began working, I started allocating money towards travel and prioritizing my goals, so I have accumulated savings specifically for travel. I also subscribe to many travel sites and follow travel companies so that I can take advantage travel promotions – I avoid traveling at full price. My credit card allows me to earns rewards in terms of travel miles. I try to use my credit card for almost every purchase possible as opposed to using cash so that I maximise on points / miles earned. I also convert all of the loyalty points earned on my Massy supermarket card to travel miles. With these miles, I fly the skies. Within the last 2 years, I took up a job in the field of tourism which requires a lot of regional / Caribbean travel so most of my travel cost related to work are covered by my company. In a nutshell, to gain a better understanding and appreciation of the world, of people and of ourselves. Our ‘island-life’ experiences are limited, but in today’s global world, travel provides us with the opportunity to experience first-hand what else is out there, see alternatives and how they function and differ from one place to another. This knowledge and understanding of various perspectives not only boost our confidence but can give rise to exciting ideas and opportunities and provide us with a new sense of purpose. Travel gives us an advantage – let us not limit ourselves. 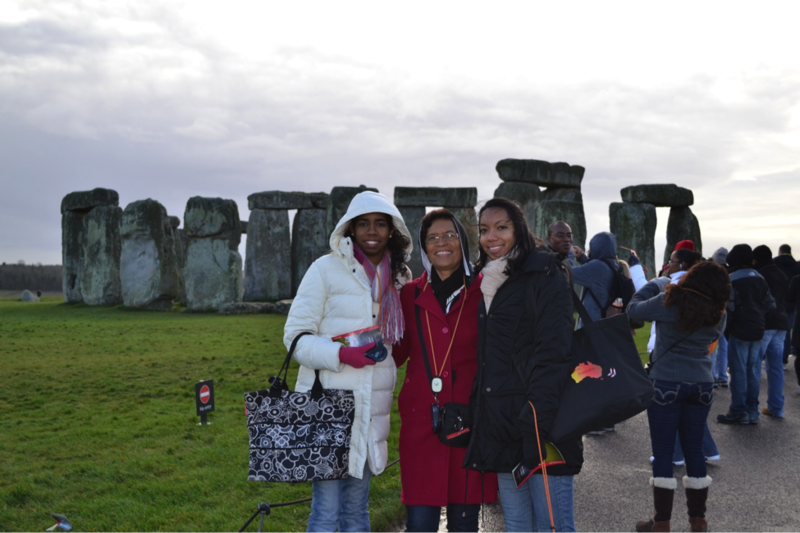 At Stonehenge, England in Dec 2012 on one of the coldest days of the year with her mom and sister – they were more ‘stone cold frozen’ than the stones! Perhaps initially. I remember the first time I tried to navigate in the subways in NYC – I was on my own, lost and confused, because we don’t have subways here in the Caribbean so I had no previous similar experience to draw on. It was all so new to me. Now, I know the subway lines and stops by heart and can easily get around the city. Likewise, I remember having to go to the self-checkout counter at a supermarket in London to scan the grocery items for myself while standing in front of a talking machine – my mind was blown, and I felt embarrassed when I couldn’t figure out how to use it. But I got help and now I prefer it to standing in the regular queues waiting for a human cashier. When we travel, our eyes are opened to some of the advancements and the fast pace of the first world, which are taken for granted by those who live in that reality daily. But it is one of the reasons for travel – to see and experience something new and different, and over time, we get used to, and familiar with, these advancements and we look forward to the next ‘new and improved’. I think people from the first world may experience a similar culture shock when they travel to less-developed countries. For example, we in the Caribbean take ‘island-time’ and mosquitos for granted but to many of our first world visitors, those take some getting used to and over time, they learn to cope and adjust accordingly. We may feel like we’re stepping into the future when we travel to more developed countries, while those from the first world travelling to less-developed countries may think they’re stepping back in time. 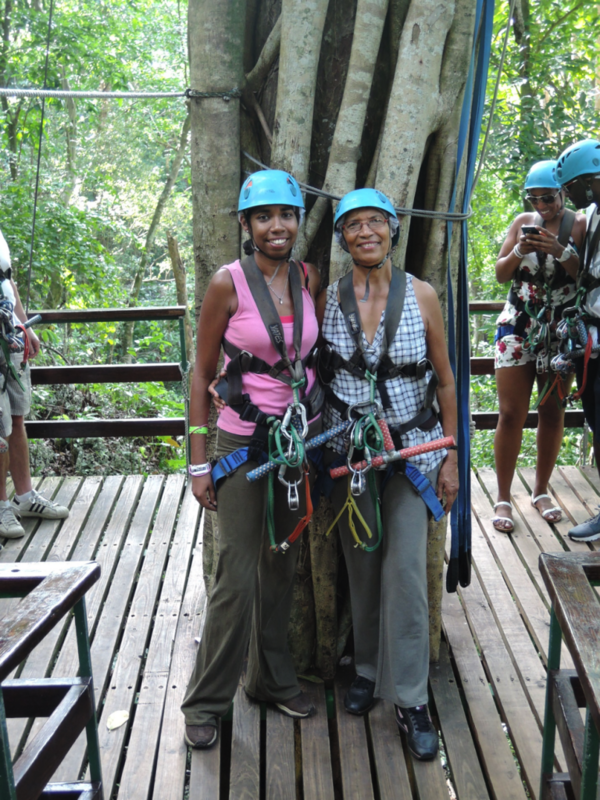 Ria Gopaul ziplining with her mom at Mystic Mountain Rainforest Adventures, Ocho Rios Jamaica in March 2016. You’re never too old for adventure! Set your mind to it, figure out how to make it happen and then go for it! Travel is not as expensive as it may seem – you just have to plan for it and work within your budget, as with everything else in life. Perhaps start with a small trip and then build up from there, and maybe have a travel buddy – for comfort and to share the good times and the cost. 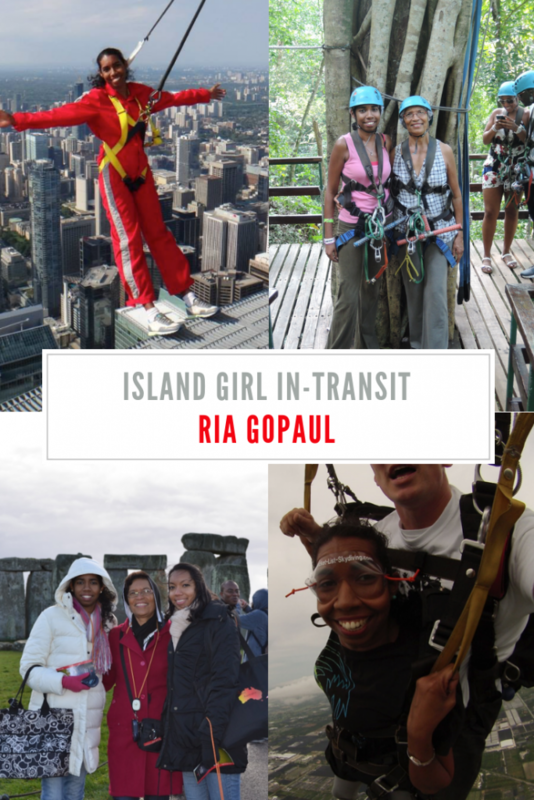 I had so much fun learning about Ria’s amazing Island Girl travel story and I hope you find it as useful as I did! Thank you so much to Ria for sharing – she really is a great inspiration! to learn more about her regional and international jaunts be sure to follow her on Instagram! Ahh, thanks so much for featuring me! 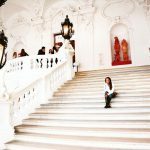 So happy to share my travel experiences and insights, and I enjoy following your travels too. Keep up the great work and Happy travels! You’re very welcome! Thank you so much for sharing your story!